Airport pick-up & airport-hotel transfer. Today your international flight will touch down in Beijing. Our professional local guide will meet you at the airport after you reclaim your luggage and clear the customs. On the way to the hotel, we will give you a brief introduction to our capital city. After we help you check in at the hotel, you will have free time for the rest of the day. Before your escorted tour starts, a brief introductory talk will be given at the hotel. You will meet the other members of your group at that time. We begin the trip with a visit to Tiananmen Square. Every early morning and sunset, people can watch the most majestic national flag raising and lowering ceremonies. 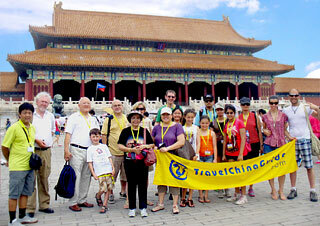 After that, you will walk for a few minutes to the Forbidden City, the imperial palace of the Ming and Qing dynasties. It is the most comprehensive palace museum, as well as the largest ancient culture and art museum, containing a great collection of valuable historical items in China. To avoid the cheap tourist restaurants as the most are doing now, we specially arrange you an a la carte welcome lunch (valued at CNY150.00 per person and included in our price) at a famous and elegant restaurant, where you will be served with signature Chinese food and tasty Peking Roast Duck. The afternoon visit will take you to the Temple of Heaven. Four times larger than the Forbidden City in area, the Temple of Heaven has always been a sacred imperial temple for the emperors to sacrifice to the God of Heaven and pray for a good harvest year. Not far away from the site of the Temple of Heaven, it is the Red Theater, where you will enjoy a grand visual feast of the splendid Chinese Kung Fu Show. Today you will come to visit the highlight of your trip, Mutianyu Great Wall. Mutianyu is one of the most popular sections of China Great Wall. No travelers can help feeling the excitement of witnessing this world wonder. To better enjoy the trip, we specially arrange the round way cable car taking you to the best part of the wall. At this time, you may think of drinking a glass of red wine to celebrate the memorable moment. Please rest assured; we will leave no regret for you. We would like to arrange red wine for our valued guests toasting on the amazing wall. The restaurants nearby the sites are in low quality, which absolutely are not up to our standard, so we do not arrange the lunch today. It may be the best that you have a big breakfast and have some fast food for lunch by yourself. After that, we will drive you back to downtown. Along the way, you will have a chance to see the Olympic National Stadium (Bird's Nest) at close range. Then pay a visit to a local market before heading back to the hotel. After breakfast this morning, you will check out of the hotel. 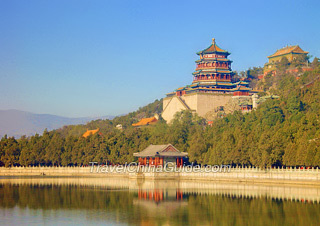 Our guide will first transfer you to visit the Summer Palace, the largest and best-preserved imperial garden. It is mainly composed of the Longevity Hill and Kunming Lake and three quarters of the garden is water area. Focusing on the essence of garden art, the 728 meters Long Corridor with delicate artistic drawings and designs is the most representative part of the palace. The next stop will involve the traditional Hutongs, where the narrow alleys, old-style courtyards, peddlers along the streets and these amiable local people will surely leave you with unique impressions of old Beijing. Besides, trying to make Chinese paper cutting will be an add-on experience to your Hutong visit. An a la carte lunch (valued at CNY150.00 per person and included in our price) will be served at a decent local restaurant. You may order your favorite Chinese dishes and enjoy it leisurely. Then you will be transferred to the airport to take a flight to Xi'an. Your local guide will meet you outside the baggage claim area of the airport, and get you checked in at the hotel. There will be an expected trip to the Terracotta Army this morning. Thousands of life-size pottery soldiers had been made to guard the first Emperor of Qin after his death. Don't be surprised that you could not find two soldiers alike as they were made exactly identical with the real royal army 2,200 years ago. To avoid the mass-produced food at the cheap tourist restaurants near the warrior site, we will offer you a home cooking a la carte lunch (valued at CNY120.00 per person and included in our price) at a family home. You can take this opportunity to have a close contact with the locals and get to know the way of their lives by talking with the host. If you are interested, the host can also teach you how to cook Chinese food with the assistance of your guide. After lunch, you will visit Xi'an Museum and then the Small Wild Goose Pagoda, which was a famous ancient stupa initially built about 1,300 years ago. This evening, the Tang Dynasty Music and Dance Show will impress you while enjoying the famous Dumpling Dinner. Since the theater is usually not open in Jan, Feb, Mar and Dec, we will not arrange the show and dumpling dinner for tours starting during the periods. Clients will enjoy free time to relax. After breakfast, you will take a leisure walk in the City Wall Park in the company of our guide and see how the locals go about their daily life. Then practice Tai Chi with the master. Next, you will visit the City Wall. With about 600 years' history, the City Wall is the most well-preserved ancient fortification in China. Travelers can ride a bicycle or electric car on the top of the wall, but you need to pay the rental fee on the spot by yourself. It should be a fascinating experience. Around noon, we will serve you an a la carte lunch (valued at CNY120.00 per person and included in our price) at a popular local restaurant with tasty food. Please take your time to enjoy it. In the afternoon, you will board a flight to Shanghai. Transfer from the airport to the hotel will be arranged. You will have a three-night stay at this hotel. This morning you will start from the famous Shanghai Museum, which is a large museum of ancient Chinese art built in 1952. Among its huge collections, the displays of bronze vessels in Shang and Zhou dynasties, ceramic objects of different historical periods and ancient paintings and calligraphy, grace the museum with their incalculable value. 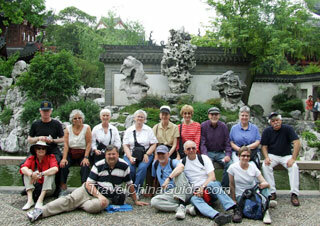 The next stop is the Yu Garden, a classical Chinese garden built in 1559. Surrounding the garden, there is a bustling bazaar where you are able to find various storefronts selling different kinds of local snacks and souvenirs. To taste the good Shanghai cuisine, we would like to arrange an a la carte lunch (valued at CNY120.00 per person and included in our price) for you at a famous local restaurant. 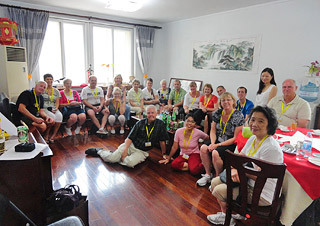 In the afternoon, our guide will take you to have a walking tour in the Former French Concession and then move on to the Bund area, where you will take a one-hour cruise tour along the Huangpu River. You will have some free time to stroll along the Bund. The most attractive site in the Bund area is a group of western-style buildings from the colonial period, including Gothic, Baroque, Romanesque, Classicism and the Renaissance. In the morning, you will be transferred to Suzhou in about 1.5 hours. 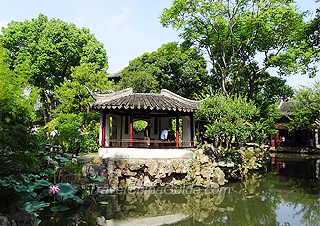 Then start your Suzhou exploration with a visit to the Humble Administrator's Garden, which is the most famous and largest classical landscape garden among other ones. 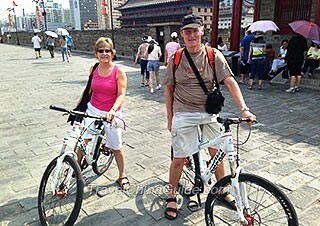 Then you will take a tricycle to travel around Suzhou old town. Lunch is served at a nice local restaurant. The last destination in Suzhou is the Tongli Water Town, where you can appreciate the ancient buildings of the Ming and Qing dynasties and immerse yourself in this peaceful environment by strolling around the old town. Your amazing journey comes to an end when the guide transfers you back to Shanghai and say goodbye to you at the hotel lobby. After having breakfast, you are supposed to check out the hotel before 12:00 and find your own way to the airport. We suggest you book a taxi at the hotel in advance. It takes around one hour driving to the Pudong airport. The ride to Hongqiao airport takes about an hour and a half. We wish you a happy and smooth trip back home. Prices are per person in US Dollars; departures are guaranteed even with two persons! Remark: The prices in red reflect the current discount. Overall, I enjoyed my journey to China. This was my second guided journey however, I believe it was my favorite. Everything was very well done starting with the airport pickup. My Beijing guide Sara and Xi'an guide Carol were both very good. I also like Charlie the Shanghai guide but my time with him was limited so I did not get to know him as much. Both Sara and Carol were creative and fun to be around. 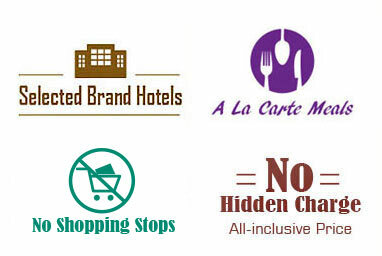 All of the hotels were very good. The Xian and Shanghai hotels were very high class and nice to stay in. I felt all of the meals were very nice and well done. The drivers were all great and got us to our destinations without a problem. All of my questions about the trip were answered in a timely manner and I always got an answer. It was an experience of a LIFE TIME. The organization was excellent & professional. The guides' knowledge was superb & the drivers were very efficient! Arrive at PVG, take the Maglev and metro. Line 2? Where can I go out of the metro? You can take the Maglev train from PVG to Longyang Road Station first. Then transfer to metro line 2 to People's Square Station, Exit 11. You can easily find the direction because there are clear English signs at the metro station. Afterwards, walk southwest around 600 meters to find the hotel. In addition, you can purchase the card at the Maglev Station Service Center. I am currently In china with single entry tourist visa. Using the 144h free visa as second entry in Shanghai. The real question is can I take domestic flight with that visa and get to Beijing with it? You cannot. 144 visa-free transit (which is not a "free visa") allows transit in Beijing or Shanghai, but not both. If you will be in China for less than 24 hours (from scheduled arrival in Shanghai to scheduled departure from Beijing) then 24 hours transit without visa would apply. How about if I take a train instead of a flight for Shanghai-Beijing? I mean I read that I am allowed to take trains and bus using the 144h visa free rule, right? You cannot take a train either. Anyway, that's irrelevant, because if your itinerary doesn't qualify then you won't even get to China, because you'll be denied boarding at your origin. Well, it is doable to head straight for Suzhou. You are suggested to take Maglev + subway line 2 to Hongqiao Railway Station, where there are high speed trains to Suzhou and it takes about 25min. To get back to Pudong Airport, you can use the same way. Anyway, I still wanna tell you that Shanghai also has worthy things to enjoy, such as Huangpu River, the Bund, Oriental Pearl TV Tower, Nanjing Road. Plan to visit Xi'an, Beijing, Shanghai. Is there a public transportation card for using in 3 cities? Or maybe can I get a card in Xi'an and return it in Shanghai? Please advise. Thanks. Sorry but you can’t do that. The transport card can’t be shared in the three cities. But you can buy the 3 day pass in Shanghai and Xi'an, which allows you to use the metro without limits in the three days. What's the last train from hongqiao railway station to pudong airport on Monday? As I know, the last train leaves at 22:48.